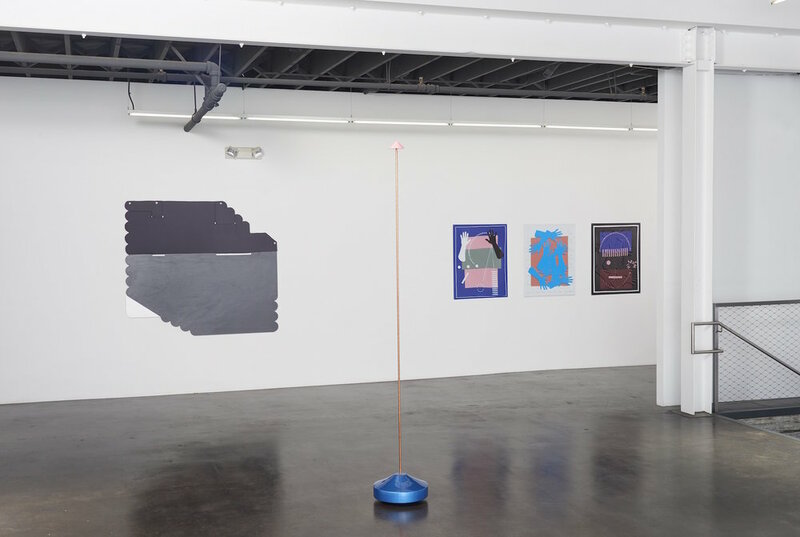 Twist presents the work of four artists working in geometric abstraction. As the title suggests, particular attention is given to the ways these artists bend, swivel and cut loose from conventional boundaries. Interrogating modernist art history, the works in Twist probe the formal properties of line, volume, color, texture, pattern, language and shape in order to satisfy both intellectual curiosity and visual pleasure. José León Cerrillo’s “Echoes” series consists of multicolored PVC wall reliefs. Symbols such as hands and letters create layers within the compositions that evoke signage or informational charts. In these works and his sculptural practice, Cerrillo uses repetition and reconfiguration to build context and meaning. Reuven Israel’s slick but handmade sculptures have been coated in perfectly smooth layers of car paint. Out of the Blue consists of three components: a sky blue base, a thin copper rod and a pink conical finial. The minimalist shapes suggest scepters, antennae or an ornamental body with a head and torso. Ruth Root’s large paintings combine custom-designed patterned fabrics and colored Plexiglas components. The irregularly shaped panels are hung flush against the wall like silhouettes. The use of a black and white palette, punctuated with chromatic pops of yellow, coral, and purple, suggests logos and decals. Although Lisa Williamson’s “Body Board” series is fixed to the wall, these sculptural paintings extend into the gallery space. The paired down color palette and simple shapes open conversations about symmetry, doubling, and counting. Meanwhile, Williamson’s titles such as Clench and Nerves use language to make bodily provocations. The works in Twist resist simple classifications and rest in a space between the minimal and fantastic, the humorous and the serious. Despite their abundant references to the human form, architecture, machines, and landscapes, these subtly strange paintings and sculptures display a commitment to abstraction, ambivalence and ambiguity. José León Cerrillo (b. 1976, San Luis Potosí, Mexico) received his BFA from the School of Visual Arts and MFA from Columbia University. Recent projects include Undisciplined Interludes at LIGA, Mexico City; Okayama Art Summit, curated by Liam Gillick and the Gwangju Biennale, curated by Maria Lind, in 2016 as well as Registro 04 at Museo de Arte Contemporáneo de Monterrey, Mexico and The New Museum Triennial curated by Lauren Cornell and Ryan Trecartin in 2015. Cerrillo’s work is in the collections of the Fundación Jumex in Mexico City and Moderna Museet, in Stockholm. He lives and works in Mexico City. Reuven Israel (b. 1978, Jerusalem) received an MFA and BFA from Bezalel Academy of Art and Design in Jerusalem. He has had solo exhibitions at Tel Aviv Museum of Art; Braverman Gallery, Tel Aviv; Fridman Gallery, New York; and Museo Civico Floriano Bodini, Gemonio, Italy; among others. His work has also been included in group exhibitions at Danese Corey, New York; Tel Aviv Museum of Art; Lesley Heller Workspace, New York; Haifa Museum of Art; Rockefeller Archaeological Museum, Jerusalem; and Hangar Bicocca, Milan. Israel lives and works in Brooklyn, NY. Ruth Root (b. 1967, Chicago, IL) received an MFA from The School of the Art Institute of Chicago in 1993. She has had solo exhibitions at Aldrich Contemporary Art Museum, Ridgefield, CT and 356 Mission, Los Angeles, CA. Her work has been included in group exhibitions at Kunstmuseum Bonn, Bonn, Germany; Albright Knox Art Gallery, Buffalo, NY; Los Angeles County Museum of Art, Los Angeles, CA; Seattle Art Museum, Seattle, WA and MoMA PS1 Contemporary Art Center, New York, NY. Root’s work is in the permanent collections of Austin Museum of Art, Bard College, Hirshhorn Museum and Sculpture Garden, Los Angeles County Museum of Art and the Whitney Museum of American Art. She lives and works in New York. Lisa Williamson (b. 1977, Chicago, IL) received her MFA from University of Southern California, Los Angeles in 2008. Recent solo and two person exhibitions include Eleven Holes, a public art commission by LAXART at Kings Road Park, West Hollywood; People in Nature at Tif Sigfrids, Los Angles, Bromeliad Colors Prefer Soft Lightat The Finley, Los Angeles and Weird Walks Into a Room (Comma) at The Box, Los Angeles. 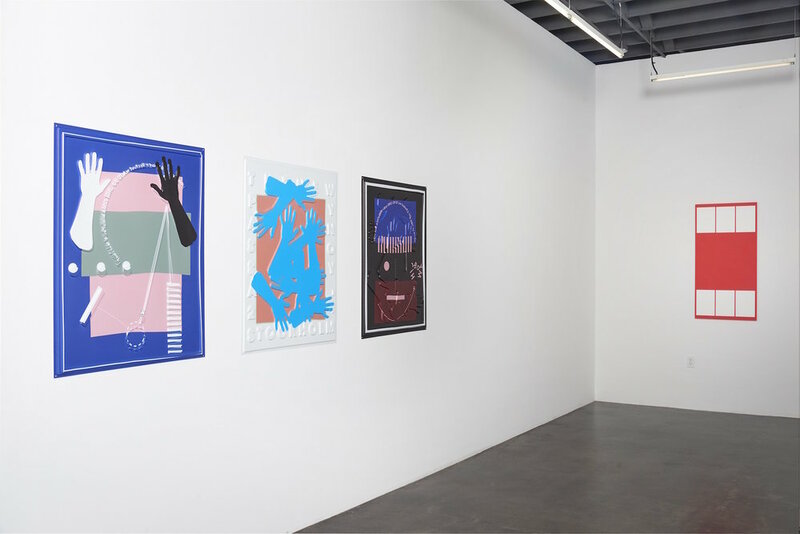 Select Group exhibitions include, No Vacancies, Marianne Boesky Gallery, New York; Variations: Conversations In and Around Abstract Painting, Los Angeles County Museum of Art, Los Angeles; Made In LA: 2012, The Hammer Museum, Los Angeles and Reframing, CCA Andratx Kunsthalle, Mallorca, Spain. Williamson lives and works in Los Angeles, CA.